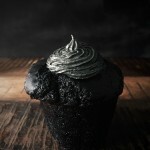 Black Cupcakes w/ Sliver Frosting – Halloween Addition. A party just isn’t complete without a nice sweet snack/dessert, and since we’re still working towards a spooky Halloween menu why not make a spooky recipe for cupcakes!? 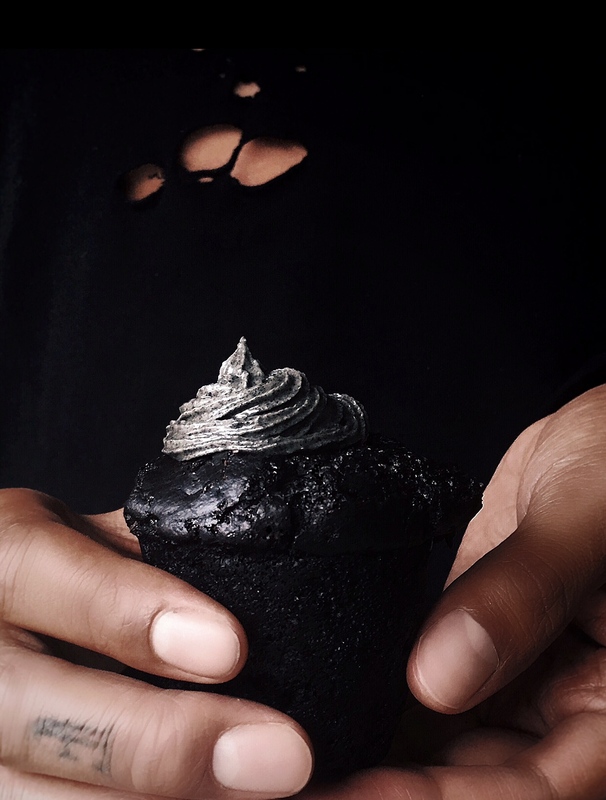 These cupcakes are moist and rich with a decadent silver frosting that will ward off all the evil spirits, some might even say that this frosting will even protect you from werewolves. No I didn’t use any funky food colouring, just black tahini which you’ll find a recipe for over here. By now you might have figured out that black tahini will be making an appearance into almost every Halloween dish this year, so go to your nearest asian grocery store and get yourself a big bag of black sesame seeds, it’s worth it! You can also order the seeds or the tahini on-line if you don’t have any store selling these product near you. Now to be honest even though the frosting adds a nice flare of magic it isn’t very necessary since the muffins are sweet by them selves, having said that, it does add to the presentation and might be just what you need! 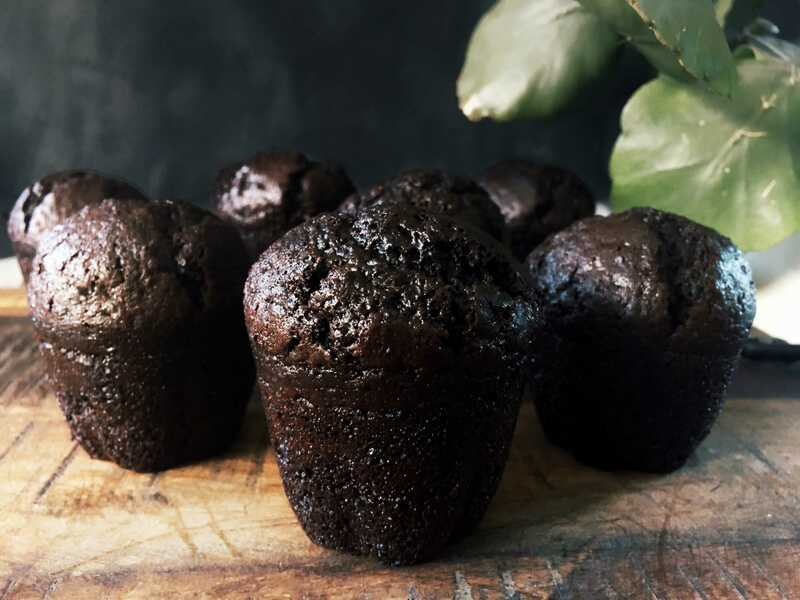 You can also skip the black tahini if you don’t have any on hands and still want moist and dense cupcakes, or use less like the picture below. 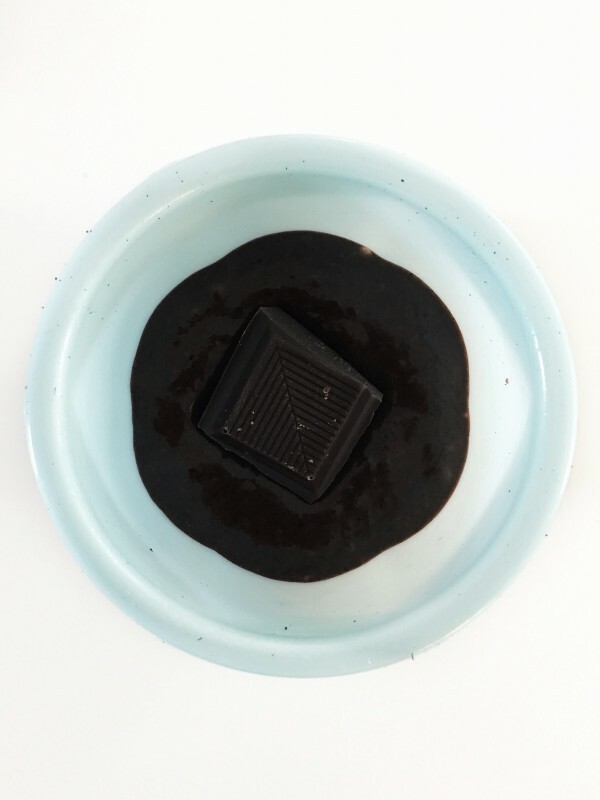 One thing to keep in mind when using black tahini is that you’ll want to let the cupcakes cool before you eat them, cause otherwise the taste of the tahini will dominate the cacao and that’s, not, delicious! But once they’ve cooled down they’re the most delicious chocolate cupcakes ever! These cupcakes were an instant fave for my family, they weren’t to sweet and perfectly moist, just the way they like them! I also sneaked a couple of pieces of chocolate in the batter so some cupcakes would have a chocolate core, because who doesn’t like a chocolate overdose!? You can expect even more Halloween themed recipes during the next week so we’ll all be ready for our Halloween parties, or ready to simply indulge, parties are overrated anyway! I really hope you like these recipes and feel free to leave a comment below or to tag me in your spooky creations on Instagram and don’t forget to like my Facebook page. Black Cupcakes w/ Sliver Frosting - Halloween Addition. Preheat your oven to 175 celcius or 350 Farenheit. Add the crushed flax seeds and water to a bowl and let it sit for about 5 minutes to form the egg substitute. After this add the rest of the wet ingredients and whisk it well. Now in a separate bowl add the dry ingredients (or not and add it straight to the wet). And whisk to combine. Now add the dry to the wet and stir till you get a nice cake batter. Now grease your muffin tins/molds and evenly distribute the batter, you can even sneak a little piece of chocolate in the batter. Bake the muffins for about 25 minutes or until you poke it with a skewer and the skewer comes out clean. After they are done remove them from the oven and let them cool. Enjoy.